STEP ONE: We admitted we were powerless over cocaine and all other mind-altering substances—that our lives had become unmanageable. TRADITION THREE: The only requirement for C.A. membership is a desire to stop using cocaine and all other mind-altering substances. Many people come to Cocaine Anonymous thinking one of two things: “I rarely (or never) even used cocaine. As a newcomer, you may have thought or said, “What’s this talk about God? I came here to stop using cocaine, not to join a new religion.” Don’t feel alone. Many of us were put off with the talk about God when we first came to meetings. It is easy enough to confuse the word spirituality with religion. As it relates to God, Cocaine Anonymous is a spiritual program, not a religious one. If you have ever questioned the meaning of anonymity, perhaps this pamphlet will help. One definition of “anonymous” is “nameless.” Anonymity is vital to the continued growth and existence of Cocaine Anonymous, and the Fellowship’s name contains an implicit promise of privacy. By treating who we see and what we hear at our meetings as confidential, C.A. remains a safe place to share our experience, strength and hope. In addition to finding a spiritual way of life, recovery is about changing negative aspects of our personalities into positive ones. We came into the program with big egos but little or no self-esteem. We thought we were better than other people yet, at the same time, felt “less than.” We were people who took from others and abused friendships all of our lives. We had no concept of doing anything for anyone without the thought of some kind of reward. You’ve likely heard lots of talk at Cocaine Anonymous meetings about working the Twelve Steps of Recovery, recovery, finding a Power greater than ourselves, and getting a sponsor. If you’re like most newcomers, however, you’re probably not sure what all these terms mean. This is why it’s a good idea to get a sponsor. A sponsor can devote individual attention to answering your questions regarding the C.A. program of recovery. It is the collective experience of the members of Cocaine Anonymous that addiction is a problem not limited to cocaine or any other mind-altering substance. With this in mind, we suggest you answer the following questions:1. Have you ever used more cocaine, alcohol or other drugs than you planned? 2. Has the use of cocaine, alcohol or other drugs ever interfered with your job? Welcome to Cocaine Anonymous. We are all here for the same reason—our inability to stop using cocaine and all other mind-altering substances. The first step towards solving any problem is admitting that there is a problem. THE PROBLEM The problem, as we see it, consists of an obsession of the mind and an allergy of of the body. The obsession is a continued and irresistible thought of cocaine and the next high. “… we aren’t a glum lot. If newcomers could see no joy or fun in our existence, they wouldn’t want it. We absolutely insist on enjoying life.” One of the most surprising things a newcomer may hear at a C.A. meeting is the sound of laughter. How is it possible that the same people who probably started drinking or using drugs in the pursuit of a good time are now having an even better time without mind-altering substances? It is the common experience for many of us to feel like we didn’t fit in anywhere. Drugs gave us that instantaneous feeling of belonging. When we get sober, that drug-induced feeling of belonging disappears. Finding a group of sober people we can relate to is a new start for us. We go to meetings as often as possible, preferably every day. Before long, we find we are most comfortable at one particular meeting. Our primary purpose is to carry the message of recovery to the addict who still suffers. One way we do this is by holding meetings in hospitals and institutions for people who are not able to attend outside meetings. Institutions served may include, but not be limited to, correctional facilities, sanitariums, detox units, juvenile detention centers, half-way houses and shelters, either governmental or private. Confinement may be voluntary or involuntary. Here are some tips to help you: Admit that you lack the power to stay clean on your own. Make sobriety your #1 priority. Throw away all your drugs and drug paraphernalia. Don’t deal drugs. Go to meetings daily. Get phone numbers and use them. If your dealer calls, hang up and call someone on your phone list. If no one is home and you’re in trouble, call the C.A. helpline. Stay away from people, places and things with which you associate drug use. Who is a Cocaine Addict? Some of us can answer without hesitation, “I am!” Others aren’t so sure. Cocaine Anonymous believes that no one can decide for another whether he or she is addicted. One thing is sure, though: every single one of us has denied being an addict. For months, for years, we who now freely admit that we are cocaine addicts thought that we could control cocaine when in fact it was controlling us. When we walked into Cocaine Anonymous, we looked around the room and began to wonder if we were too young to get clean and sober. Many of us were too young to have driver’s licenses, to vote, to go into bars, or even have jobs. Surely we were too young to be addicts! Our denial told us that maybe our using and drinking was just a phase. There comes a time when the cocaine stops working—a time when the coke, the other drugs, and all the madness become unbearable. By then, you just can’t stop, so you manage to score and somehow survive. You keep on using because, although it’s killing you, cocaine has become the most important thing in your life. If you somehow, some way, get a break from it, get free for a moment with a little clarity, you will know this could be your last chance. Unity is a common bond that transcends all differences. We’ve discovered no matter how different our circumstances or the paths that brought us here, we all suffer from the same disease: addiction. We admitted our lack of power and accepted that we could not recover alone. The strength and direction of our recovery is found in our unity. We are people who might never have mixed. 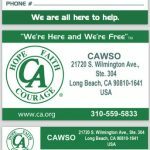 Cocaine Anonymous is a Fellowship of men and women who share their experience, strength and hope with each other that they may solve their common problem and help others recover from their addiction. The best way to reach someone is to speak to them on a common level. The members of C.A. are all recovering addicts who maintain their individual sobriety by working with others. In the ancient world, when children were discovered to be deaf, they were often disowned and left to die or fend for themselves.Currently, six to ten percent of the United States’ general population are deaf or hard of hearing. Of that number, ten percent are addicts and/or alcoholics (approximately 2 million).